Kick off Wolfsburg-Bayern Munich in 1. Bundesliga on today 13:30. Referee in the match will be Guido Winkmann. Team Wolfsburg is located in the middle of the table. (9 place). Wolfsburg in 5 last matches (league + cup) have collected3 points. 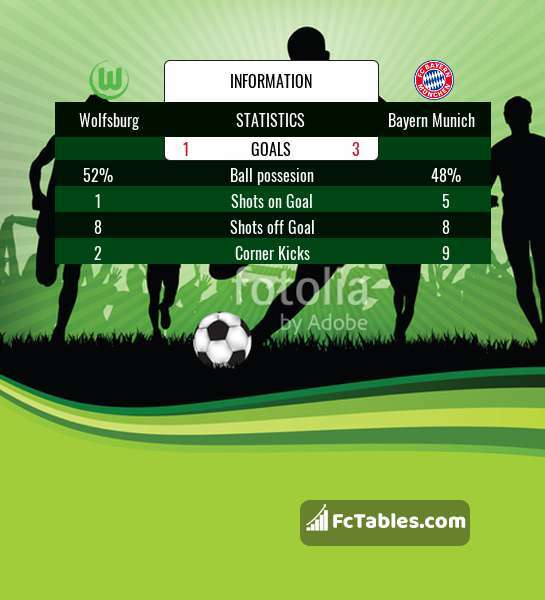 Wolfsburg from 5 matches can not beat any rival. To defend Bayern Munich the most demanding players will be Wouter Weghorst 2 goals, Admir Mehmedi 2 goals, Renato Steffen 2 goals, because this season they scored the most goals for Wolfsburg of the entire composition. Most goals developed: Wouter Weghorst 1 assists. Injuries in the team Wolfsburg: Ignacio Camacho, Jeffrey Bruma, Felix Klaus, Ismail Azzaoui. Team Bayern Munich is located in the middle of the table. (7 place). In 5 last games (league + cup) Bayern Munich get 7 points. Bayern Munich did not win the match from 3 games. Leading players Bayern Munich in 1. Bundesliga is: Robert Lewandowski 3 goals, Arjen Robben 3 goals, Thomas Mueller 2 goals. Most assists in the club have: Robert Lewandowski 1 assists, Thomas Mueller 2 assists. In Bayern Munich not occur in the match due to injury: Corentin Tolisso, Kingsley Coman. Direct matches: Bayern Munich won more direct matches. Wolfsburg won 4 matches , Bayern Munich won 34 direct matches, was a 7 draws. In 26 matches the sum of the goals both teams was greater than 2.5 (Over 2.5), and 37 matches teams scored more than 1.5 goals (Over 1.5). In 23 matches the both teams scored a least one goal (Both teams to score).